ROHM has recently released the BD9S series (BD9S400MUF-C, BD9S300MUF-C, BD9S200MUF-C, BD9S100NUX-C, BD9S000NUX-C). This series of automotive synchronous secondary buck DC-DC converters have high reliability and low power consumption in a compact form factor with a temperature range of -40C to +125C. The products are provided in a leadless package with wettable flanks. This makes them ideal for using in applications like radars, cameras and sensors for assisted driving. The series comprises of very compact, highly efficiency automotive-grade power supply ICs that incorporate an enable function to alter the startup time and a PGOOD output indication to improve system functional safety. This comprehensive lineup of products supports output currents from 0.6A to 4A. 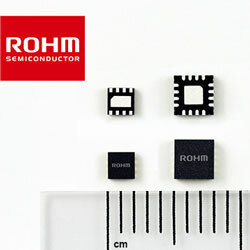 It is provided in the industry-leading 2mm2 and 3mm2 space-saving packages that offer high efficient operation, giving a best-in-class power conversion efficiency of 90% (at 3.6V input/1.8V output). Also, the current mode control ensures fast response to load transients and combined with a fixed 2.2MHz switching frequency; it stops interference in the AM Band. This higher frequency enables the use of smaller external components, which contributes to a higher degree of miniaturisation and power savings.